Despite being considered primarily as a holiday hotspot by vacationing Americans, Canadians and Europeans, the Mayan Riviera has an enthralling history that will captivate those that go searching for it during their holiday in the area. By renting a private holiday villa on the Riviera Maya, you can have a base that will make exploring the history of the Riviera Maya much easier, as you’ll have a relaxing place to get away to after a hectic day of sightseeing in the Yucatan Peninsula. While most of the important settlements of the Mayan Empire were located in the interior of the Yucatan Peninsula (Chichen Itza, Tikal, etc), this civilization had a number of important towns and cities situated where the Riviera Maya exists today. 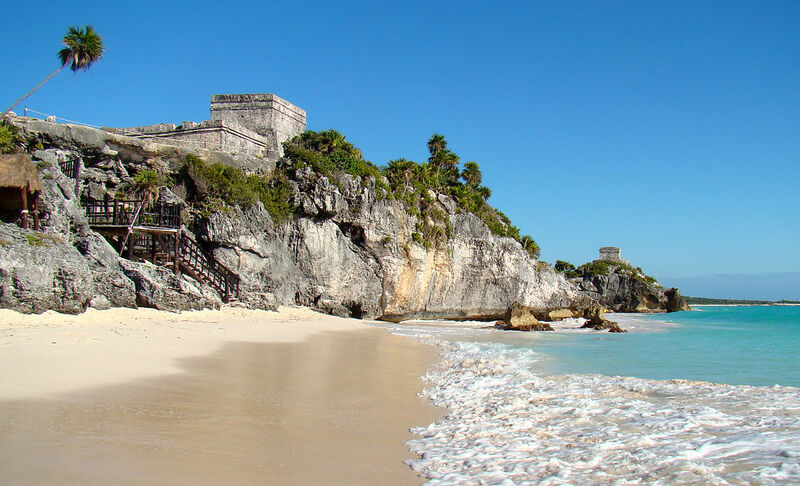 The most significant of these was Tulum, which served as a defensive point and trading port for this nation. Another settlement of measurement size was located on Cozumel, where the ruins of temples and a governor’s palace can be toured in the present day, thanks to reconstruction work done in previous years. The beginning of the end of Mayan dominance in the Riviera Maya came in the 16th century, when Spanish conquistadors landed in search of gold. While they didn’t find it, they brought with them a payload of germs that decimated local populations in Tulum and Cozumel. Within a year, 50 to 75% of residents within these communities had succumbed to smallpoz, influenza, tuberculosis and other Old World pathogens against which the locals had no acquired immunity. Fast forwarding to the 19th century, Mexico had gained its independence from Spain, but they still struggled to deal with territories that rejected the idea of centralized rule from Mexico City. Texas, Guatemala, and the Yucatan Peninsula (the Riviera Maya included) were among them, and for their determination to rule themselves, they eventually brought war upon themselves. While the prior two territories managed to eventually secede from the Mexican Union, the Mayans in the Yucatan were not as successful in their bid, though they did manage to make life difficult for the Mexican army, as a guerrilla war drug on for 50 years from 1847 to 1901, ended only when the Mayan capital of Chan Santa Cruz was finally occupied by federal troops. After the war had ended, much of the Yucatan Peninsula was ruled as a territory rather than as a state. This changed for what became Quintana Roo in 1974, making the state in which the Mayan Riviera sits the youngest in the country. Recognizing the tourism potential of the powder white sands, warm waters, and exotic Mayan ruins shortly after being organized as a state, the promotion of the lands between Playa del Carmen and Tulum as the Mayan Riviera began in the 1990’s. This has drastically shifted the economic fortunes of those in the region, giving residents options for a career beyond farming and fishing.